We’d love your help. 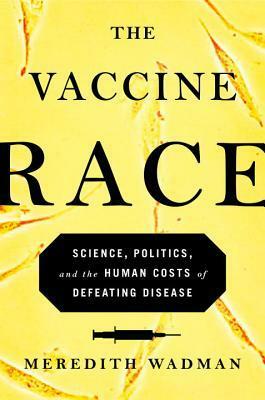 Let us know what’s wrong with this preview of The Vaccine Race by Meredith Wadman. Until the late 1960s, tens of thousands of American children suffered crippling birth defects if their mothers had been exposed to rubella, popularly known as German measles, while pregnant; there was no vaccine and little understanding of how the disease devastated fetuses. In June 1962, a young biologist in Philadelphia, using tissue extracted from an aborted fetus from Until the late 1960s, tens of thousands of American children suffered crippling birth defects if their mothers had been exposed to rubella, popularly known as German measles, while pregnant; there was no vaccine and little understanding of how the disease devastated fetuses. In June 1962, a young biologist in Philadelphia, using tissue extracted from an aborted fetus from Sweden, produced safe, clean cells that allowed the creation of vaccines against rubella and other common childhood diseases. Two years later, in the midst of a devastating German measles epidemic, his colleague developed the vaccine that would one day wipe out homegrown rubella. The rubella vaccine and others made with those fetal cells have protected more than 150 million people in the United States, the vast majority of them preschoolers. The new cells and the method of making them also led to vaccines that have protected billions of people around the world from polio, rabies, chicken pox, measles, hepatitis A, shingles and adenovirus. To ask other readers questions about The Vaccine Race, please sign up. * Vaccines work by delivering a killed or live, but weakened, version of a virus into the body, stimulating the body’s immune system into producing antibodies without actually causing an infection. * Edward Jenner gets a lot of credit for using cowpox to vaccinate against smallpox, though he wasn’t the first to think about this. * Vaccines are responsible for preventing death, disability, and disfigurement due to such diseases as smallpox, polio, measles, and even the flu. Indeed, we’ve eradicated smallpox and almost completely eradicated polio! * Vaccines do not cause autism. I love reading books like The Vaccine Race, because they make me realize how much I didn’t know that I don’t know about things! In this case, while I knew what vaccines were, I realized that I didn’t actually know how we make vaccines, the process used to kill or weaken the virus. Meredith Wadman explains this, along with all sorts of related developments in the science of vaccination. The title of this book is somewhat inaccurate, or at least too narrow: The Vaccine Race is really the story of virology and immunology in the 20th century. After all, the central character of this story is Leonard Hayflick, who does not himself develop vaccines but rather a critical line of “normal” human tissue cells that become integral to many vaccine efforts. This story goes far beyond the creation of vaccines, touching broadly on issues of biological research and human health. This is a story, albeit one supported heavily by research. Wadman begins from Hayflick’s earliest days as a scientist, chronicling his studies and start at the Wistar Institute. Along the way, she takes us on digressions to talk about other important figures and the vaccines they worked on. I love the amount of detail that Wadman goes into with regards to the science being done; equally, though, this is not just a book about science but a book about history. Wadman sets out to examine how social conditions and politics in the United States influenced vaccine development, and vice versa. In 1950 Koprowski began testing his vaccine on intellectually disabled children at Letchworth Village, a filthy, overcrowded institution for people with physical and mental disabilities in the tiny town of Thiells, New York. Wadman makes it clear here that Dr. Hilary Koprowski didn’t just happen along some intellectually disabled children—they were warehoused, making them ideal for his experiment. Of course, it’s difficult for me to say that things have gotten any better in the present day, considering we incarcerate our mentally ill when we should be helping them…. Anyway, I think the way that Wadman presents these dubious aspects of vaccine development is an important reminder that science is a human endeavour and therefore vulnerable to human flaws. Koprowski had minimized the SV40 monkey virus problem only four months earlier, when his own monkey kidney–based polio vaccine was still in the running for U.S. approval. Now, with Sabin’s vaccine rolling quickly toward being licensed, he sounded more alarmed. The scientific facts were that the SV40 virus existed and that it could potentially survive the vaccine-making progress—but the potential for harm that this posed was still up in the air, and as you can see, Koprowski was willing to change his tune if he thought he could benefit. Someone who was a brilliant scientist—or, more notably perhaps, had a talent for recognizing, grooming, and enabling the brilliance of other scientists—nevertheless keenly acted in his own self-interests when he should have been safeguarding the public good. If the WI-38 cells were ignored in the United States, abroad they were increasingly embraced.… It was a sign of the esteem in which Hayflick’s WI-38 cells were held that the British vaccine authorities … decided, perhaps as a matter of national pride, to derive their own analogous normal, noncancerous human diploid cells. I appreciate that, although largely about the US vaccine industry, the book acknowledges the global scope of medical research. In many cases, crucial advances in vaccines happened because of testing in other countries, or the participation of scientists from other countries—as is the case of Mrs. X and her aborted fetus shipped from Sweden to Hayflick to donate the cells that would become WI-38. Similarly, Wadman reminded me of the importance of scientific conferences—what might seem like a social occasion is really a chance for scientists to recombine ideas and find new, interesting avenues of exploration. If it weren’t for a meeting at a conference, Elizabeth Blackburn might not have heard of Alexei Olovnikov’s little-known theory of cellular aging and connected them to her work on telomeres. Crazy. Much of The Vaccine Race’s political treatment emphasizes the ways in which scientific and medical research’s evolution into an industry has shaped that research, for better or for worse. The pressure on scientists to secure lucrative grants, make big discoveries, and then patent those discoveries is intense. Post-secondary institutions have essentially turned into patent machines, in a sense, and this can often have an adverse effect on the quality of teaching and learning at that institution, not to mention the actual science being done and the mental health of the scientists doing it. In the end, the rubella epidemic that swept the United States in 1964 and 1965 infected an estimated 12.5 million people, or 1 in 15 Americans. More than 159,000 of these infections included joint pain or arthritis, typically in women. Roughly 2,100 people developed encephalitis, a brain inflammation with a 20 percent mortality rate. Some 6,250 pregnancies ended in miscarriages or stillbirths. An estimated 5,000 women chose to get abortions. Still another 2,100 babies were born, and survived, with congenital rubella syndrome. Of these, more than 8,000 were deaf; nearly 4,000 were both deaf and blind; and 1,800 were intellectually disabled. About 6,600 babies had other manifestations of congenital rubella, most typically heart defects. Often babies were born with several of these disabilities. These numbers are, at the very best, approximations. They come from a 1969 CDC report whose authors stressed that it was not until 1966 that physicians were required to report rubella cases to authorities. Just think about that. It boggles my mind, those numbers—they are approximate, because physicians weren’t keeping track! And that was for one epidemic among a recurring cycle of epidemics every 5 years or so! Vaccines have saved literally millions of people from death or needless suffering, and The Vaccine Race is an up-front reminder of how fortunate we are for these discoveries. The Vaccine Race is a first-rate example of science communication. Wadman is detailed but clear in her writing. I could have done without some of that detail, I think—she loves to tell me all about the backstories of every minor character in the book, and at points my eyes glazed over—but I love this blending of science and history. Moreover, this book is meticulously research, and it shows! In addition to numerous primary and secondary print sources, Wadman interviewed any key players who were still alive (a benefit to writing about recent history!). As a result, she can provide a comprehensive and intimate look at the topic, while remaining somewhat more journalistic than a book written by someone directly involved, such as Hayflick himself. I learned so many interesting things in here. I am quite thankful for NetGalley and Viking making a copy of this book available to me to review. I had hoped this would be a comparable read to Rebecca Skloot’s The Immortal Life of Henrietta Lacks and Siddhartha Mukherjee’s The Emperor of All Maladies, which are two of my absolute favorite books and were also among the first to turn me on to medical-themed literature. Instead, I found myself skimming through the book’s dense scientific and historical information: like Mukherjee’s other book, The Gene, which made last year’s Wellcome shortlist, The Vaccine Race is overstuffed with a mixture I had hoped this would be a comparable read to Rebecca Skloot’s The Immortal Life of Henrietta Lacks and Siddhartha Mukherjee’s The Emperor of All Maladies, which are two of my absolute favorite books and were also among the first to turn me on to medical-themed literature. Instead, I found myself skimming through the book’s dense scientific and historical information: like Mukherjee’s other book, The Gene, which made last year’s Wellcome shortlist, The Vaccine Race is overstuffed with a mixture of the familiar (for me, at least – genetics), the seemingly irrelevant (cell culture techniques and scientific nomenclature), and the truly interesting (questions of medical ethics). Around 60 years ago it was still possible for pregnant mothers exposed to German Measles or rubella, to have children that were born with crippling birth defects. No one really knew how the virus affected the unborn child, nor did they know the best way to fight against this disease. It was understood how you could make a vaccine to combat the virus that caused this illness and others like chicken pox, rabies, and polio, but early attempts with animal cell-based vaccines caused as many problems Around 60 years ago it was still possible for pregnant mothers exposed to German Measles or rubella, to have children that were born with crippling birth defects. No one really knew how the virus affected the unborn child, nor did they know the best way to fight against this disease. It was understood how you could make a vaccine to combat the virus that caused this illness and others like chicken pox, rabies, and polio, but early attempts with animal cell-based vaccines caused as many problems as the illness they were trying to cure. In 1962, a young biologist, Leonard Hayflick, in Philadelphia extracted cells from an aborted foetus that managed to turn the tide. These clean cells allowed scientist to create vaccines that were safe for almost everyone to use, and it carried the bland description of WI-38. This tiny collection of cells would be expanded time after time to be used to protect over 150 million children in America. Some of the cells he extracted and the methods he developed to get safe vaccines have saved billions of lives around the world. Just had to DNF this as it was too slow going. Not necessarily a bad book, just very dense and I think aimed at someone who has prior knowledge or is passionate to learn about viruses, rather than a casual reader. Disclaimer: I got an advance proof from Viking through a Goodreads giveaway. The title snagged my attention because I am a science geek; but also at the thought of the story of the human cost. And the book did not disappoint. I will say the one bad thing right up front. The story jumped around a lot, making it sometimes hard to follow. But the author had so many people, places, and times to cover that I don't know that she could have avoided that in telling such a sweep of science and modern hist Disclaimer: I got an advance proof from Viking through a Goodreads giveaway. The title snagged my attention because I am a science geek; but also at the thought of the story of the human cost. And the book did not disappoint. I will say the one bad thing right up front. The story jumped around a lot, making it sometimes hard to follow. But the author had so many people, places, and times to cover that I don't know that she could have avoided that in telling such a sweep of science and modern history. There is a lot of personal background on the scientists that paints them as real people. Dr. Hayflick provides that string through the story that helps with the timeline and other flows. But even more than him, the cells that he grows in cultures are the flow from start to finish in their importance for developing and understanding vaccines and many aspects of biological progress. The human costs aspect of the book was intriguing, since it was two-fold. There is a good bit of history of the diseases for which these vaccines were developed. The stories of children who were crippled by polio; adults killed by rabies; and babies born with defects because of rubella absolutely break your heart. And they have you rooting for the scientists developing the vaccines. But just as you are ready to stand and cheer them on, the stories of the experiments and trials churn forward. From there you are left, mouth agape, at the thought that humans did such things to each other. I won't list the types of people they used for fear of spoiling the story for you. But it is worth the read to see what was done, and how things have changed. Mind blowing. What Wadman reveals in The Vaccine Race will have you questioning your own ethics and morals. While Wadman discusses the very fascinating history of vaccines, she also reveals the unregulated, exploitative experiments on orphans, prisons, newborns, and intellectually disabled children that were tested on and/or harmed irrevocably in the process creating many vaccines. Wadman executes a neutral balance of the pros and cons in the history of vaccines, discussing the significant i Mind blowing. What Wadman reveals in The Vaccine Race will have you questioning your own ethics and morals. While Wadman discusses the very fascinating history of vaccines, she also reveals the unregulated, exploitative experiments on orphans, prisons, newborns, and intellectually disabled children that were tested on and/or harmed irrevocably in the process creating many vaccines. Wadman executes a neutral balance of the pros and cons in the history of vaccines, discussing the significant impact made in the battle against diseases as well as raising questions of what is ethically and morally acceptable. The Vaccine Race will leave many questioning if the gain worth the cost. This book chronicles the life of Dr Leonard Hayflick, who rose from humble beginnings as a poor Jewish kid from Southwest Philadelphia to become the inventor of the first human diploid cell line, and to determine that these and other normal human cells can only divide a limited number of times before they die, which later became known as the Hayflick limit. One cell line, WI-38, created while he was a staff member of the Wistar Institute in Philadelphia, became the host for viruses used to creat This book chronicles the life of Dr Leonard Hayflick, who rose from humble beginnings as a poor Jewish kid from Southwest Philadelphia to become the inventor of the first human diploid cell line, and to determine that these and other normal human cells can only divide a limited number of times before they die, which later became known as the Hayflick limit. One cell line, WI-38, created while he was a staff member of the Wistar Institute in Philadelphia, became the host for viruses used to create effective vaccines against rubella (German measles) by Dr Stanley Plotkin, and against rabies, by Dr Hilary Koprowski, the long time director of the Wistar Institute, and his colleagues. Hayflick is portrayed as a dedicated and driven but underrecognized researcher, whose dogged persistence and willingness to skirt established norms allowed him to gain recognition for his discoveries, but led him to fall afoul of the National Institutes of Health, which derailed his work at the height of his career. In The Vaccine Race, Wadman also describes the devastating effects that congenital rubella had on affected infants and their parents, along with rabies, an infection that is nearly always fatal if not diagnosed in time. The book also covers the fierce internecine battles within the Wistar Institute, and amongst the research teams who worked feverishly to become the first to have their vaccines created and approved for public use, while undermining their competitors at the same time. The massive egos of these researchers and the government officials charged with approving the vaccines are on full display as well. I really enjoyed this, and I read it at a very opportune moment — at exactly the same time as I had my lab skills residential school in Milton Keynes. The techniques described were mostly not the same, but there was some crossover, and it was great to think about how I might one day contribute to the same science, if I go that route. My only quibbles with this book were with the sometimes unfocused feel; there’s a lot of scientists which it tracks quite closely, and sometimes I wondered how rele I really enjoyed this, and I read it at a very opportune moment — at exactly the same time as I had my lab skills residential school in Milton Keynes. The techniques described were mostly not the same, but there was some crossover, and it was great to think about how I might one day contribute to the same science, if I go that route. My only quibbles with this book were with the sometimes unfocused feel; there’s a lot of scientists which it tracks quite closely, and sometimes I wondered how relevant all of the details are. It’s also got a bit of a divide between the WI-38 cells, which were used to make vaccines, and the vaccines themselves; there’s a lot of focus on the cell line, and sometimes that wasn’t directly relevant to the vaccines. It’s interesting stuff, particularly when it comes to the commercialisation of science, but it didn’t always feel like it fit with the story of the vaccine race. In that sense, it sometimes felt like two almost-separate books. It’s also odd because Wadman clearly champions Hayflick, the creator of the cell line, despite his rather indefensible actions — dismissing them as being due to ‘stubbornness’. Sorry, but if you have a legal contract and you’ve agreed to it, you can’t just forget about it. If you object to the way things are being sorted out, you don’t abscond with the cell line — you get a lawyer. It doesn’t sound like Hayflick meant any harm, though I am conscious of Wadman’s bias there, and it’s probably true that he deserved better from the use of his cell line — but even so, he was not in the right. Other than that, there are also some very worthwhile discussions of the ethics of vaccine production. They were often tested on vulnerable people who couldn’t consent, and the WI-38 cell line came originally from the lung cells of an aborted foetus. It’s worth remembering these facts, even with the undoubted good done by the availability of vaccines. It's interesting to learn about the innumerable intricacies and machinations come into play in order to generate something that is truly paradigm-changing. When people discuss going back to a time before agriculture (I'm looking at you, Derek Jensen) two of the major things that would prevent me from wanting to do so are antibiotics and vaccinations. See, I am very happy to live in a time where the only needless childhood illness that I suffered from was the Chicken Pox, and I was among the last It's interesting to learn about the innumerable intricacies and machinations come into play in order to generate something that is truly paradigm-changing. When people discuss going back to a time before agriculture (I'm looking at you, Derek Jensen) two of the major things that would prevent me from wanting to do so are antibiotics and vaccinations. See, I am very happy to live in a time where the only needless childhood illness that I suffered from was the Chicken Pox, and I was among the last to even have to suffer from that. I am grateful that my parents had me vaccinated against so many illnesses that could have killed me had I grown up 100 or even 50 years prior to when I did. The Vaccine Race really explores what went into the childhood vaccines that we take for granted today. (Or maybe, we don't. See the resurgence of whooping cough as a terribly reality that just because some folks don't believe in science, doesn't mean that science still can't hurt them.) Not only do you have the egos of prominent physicians, surgeons, and medical researchers; not only do you have a research environment devoid of informed consent and HIPAA; not only do you have government officials who may or may not have the public's best interest in sight; not only do you have whistleblowers and those with varying philosophies, religions and ethics; but then you have all of these forces converging to lead to the medical landscape that we inhabit today, for better or for worse. This was fascinating, the history of vaccine research and trial-and-error, the beginnings of fetal tissue research (which I had zero idea about and am SO fascinated by), abortion, and a whole pile of questions about medical ethics. This is perhaps a little more dense than, say, The Immortal Life of Henrietta Lacks (which I loved, btw), but it was a topic I knew very little about and really appreciated and am fascinated by Wadman's introduction. Once upon a time scientific research was done for the well-being of mankind . Somehow during the second half of the 20th century the motivation of research scientists appears to have changed. It became much a cut-throat business. Meredith Wadman's book describes how research scientists variably supported each other, assisted each other, blocked each other, tripped each other and stole each other's ideas. Much of the focus is on Leonard Hayflick and his development of a growth medium cells derive Once upon a time scientific research was done for the well-being of mankind . Somehow during the second half of the 20th century the motivation of research scientists appears to have changed. It became much a cut-throat business. Meredith Wadman's book describes how research scientists variably supported each other, assisted each other, blocked each other, tripped each other and stole each other's ideas. Much of the focus is on Leonard Hayflick and his development of a growth medium cells derived from fetal lung tissue (WI-38) for use in developing vaccines. He was competing with growth medium cells coming from green monkey brain and duck embryo, both likely to harbor bacteria or cancer causing agents. Hayflick fought for over a decade to have his growth medium approved. We learn how Stanley Plotkin developed his vaccine for Rubella and then others for polio, rabies, chicken pox adenovirus etc. An ethical question that I have always tossed around was whether biomedical companies are entitled to take cells from a patient without consent and use them in experiments. In Rebecca Skloot's fabulous non-fiction book The Immortal Life of Henrietta Lacks, HeLa cells came from the cervical cancer cells of Lacks half a century ago and are still used generating billions of dollars for biotech and pharmaceutical companies, while the progeny of Henrietta Lacks are unable to afford college. I don't know the fate of Mrs. X from whose aborted fetus derived the lung cells that generated WI-38 growth cells in 1967, which are still being used today. I do know that billions of dollars have been made and that Mrs. X profited nothing. One thing that I found interesting and heartbreaking was how scientists did, and do to this day use marginalized people as test subjects. In June 1966 Henry Beecher, a doctor who specialized in anesthesia at Harvard Medical School, published an article entitled "Ethics and Clinical Research" in New England Journal of Medicine. It shook the medical establishment. Beecher outlined, without naming names or institutions, twenty-two human experiments chosen from the medical literature from 1948 through 1965 that, he reported, had risked the health or life of their subjects. "Grave consequences have been suffered as a direct result of experiments described here," the paper began--experiments for which, Beecher wrote, "it must be apparent that (subjects) would not have been available if they had been truly aware of the uses that would be made of them." The experiments had been conducted by doctors at prestigious hospitals and universities, including the Clinical Center, the huge research hospital at the NIH. They had been published in top medical journals and funded by the NIH, the U.S. military, drug companies, and private foundations. What was more, Beecher had chosen the twenty-two from a far longer list of ethically suspect studies that had not been difficult to compile. The abuses are everywhere. In one experiment doctors had withheld chloramphenicol, a treatment known to effectively fight typhoid fever, from charity patients with the disease, to see if they died at greater rates than patients who received the drug. (They did.) In another, they witheld penicillin, which was known to be effective against strep throat, from a control group of 109 U.S. airmen with the ailment, knowing that they could develop well-known, potentially life-threatening complications. Three men went on to do so after the bacteria in their throats spread. Children in an institution for the "mentally defective" were purposely infected with hepatitis A virus (This institution, it emerged, was New York's Willwbrook State School for the Retarded, another horrible holding pen, and the pediatrician who infected the children was the prominent Saul Krugman, the same man who had earlier infected children with rubella.) Separately twenty-two elderly, senile hospitalized patients were injected with living liver cancer cells and told simply that they were receiving "some cells." Leading this trial was the prominent cancer scientist Chester Southam of Memorial Sloan- Kettering Cancer Center, whose example Hayflick and Moorhead had followed in deciding to inject dying cancer patients with the new human diploid cells in 1960. The list went on. Johns Hopkins Medical Center continues to this day to use marginalized persons for test subjects without their knowledge or consent. THE VACCINE RACE. (2017). Meredith Wadman. **. I’m not sure where my expectations came from, but this work didn’t meet them. I had hoped for a general survey of the field of vaccines – their development and uses. It turned out that this book was more a history of The Wistar Institute. There’s nothing wrong with that, but such a work belongs more in the hands of the specialists rather than those of the general reader. Although I was trained in the sciences, I have little knowledge of the world of THE VACCINE RACE. (2017). Meredith Wadman. **. I’m not sure where my expectations came from, but this work didn’t meet them. I had hoped for a general survey of the field of vaccines – their development and uses. It turned out that this book was more a history of The Wistar Institute. There’s nothing wrong with that, but such a work belongs more in the hands of the specialists rather than those of the general reader. Although I was trained in the sciences, I have little knowledge of the world of microbiology, and was hoping to get a leg up through this book. Didn’t happen. Instead, I was overwhelmed with the work done at Wistar over the years, along with the men who were responsible for it. The Wistar is a well-known institute here in Philadelphia, and has earned the respect of scientists over the years. It is known for developing vaccines for a variety of diseases, and in supporting the scientific community in general in facilitating research into that field. If you are not of that field, however, the names will be unfamiliar to you – along with the achievements of each player. When I was a sophomore in college – studying chemistry – I somehow was able to get a tour of this institution. I don’t remember what brought it all on, but it happened. When I made my tour through their collections, assisted by one of their staff, I was overawed: I didn’t realize that any place had collections like these. There were rows and rows of body parts in jars, along with a great number of fetuses in various stages of development. To a chemistry major, I failed to grasp the point of the collection. Later, I realized the importance of having a collection like this for education purposes – but it escaped me at the time. This being said, I left the tour not much smarter than when I went in, but, in retrospect, I believe it opened my eyes to the need for such a collection. The problem for me today was that my interest is of a general nature, not focused on the details of the achievements of Wistar staff. All I can say is that I got a lot of practice in on my skimming with this book. It simply turned out that I was looking for one thing, and found another. This book centered around Hayflick, and his cells, although it did a good job of portraying how devastating diseases such as Rubella and Polio used to be. Wadman also spends considerable time on the shift from "doing science for the good of mankind" to the rise of the big pharma companies from today. Although Wadman tries to bring in plenty of human interest by telling the stories of people affected by diseases (as well as the by the vaccines), I found the book a little dry. I saw it was compared This book centered around Hayflick, and his cells, although it did a good job of portraying how devastating diseases such as Rubella and Polio used to be. Wadman also spends considerable time on the shift from "doing science for the good of mankind" to the rise of the big pharma companies from today. This is a great non-fiction book spanning the history of the vaccine. It covers the science, the politics, the human drama and the morality. Wadman jumped around just a little to much for me. I feel the subject matter she decided to tackle was really just too much for a single book. A little less detail (or a little more editing!) in places would have really helped this book. Perhaps an abridged version for the passingly interested? For example I didn't much care about the family life of some of This is a great non-fiction book spanning the history of the vaccine. It covers the science, the politics, the human drama and the morality. Wadman jumped around just a little to much for me. I feel the subject matter she decided to tackle was really just too much for a single book. A little less detail (or a little more editing!) in places would have really helped this book. Perhaps an abridged version for the passingly interested? For example I didn't much care about the family life of some of the scientists, descriptions of their romantic and personal lives didn't further the story for me. She has tried to make a Henrietta Lacks style personal story but the subject is too broad to have the same impact. This is still a solid and interesting read though. Wadman explores how this branch of medicine quickly became an industry and what that has meant for us as consumers. She discusses the far reaching effect of how that financial factor has shaped the research and lead the discussion throughout the 20th century. Wadman charts the story of Leonard Hayflick, from his humble beginnings in Philadelphia to his time at Stanford at the other end of the country, and follows his battles, discoveries and controversies along the way. In a way the real story here begins with the aborted foetus belonging to a mysterious woman by the name of Mrs X from Sweden. Hayflick would adopt the use of these tissue cultures to create his WI-38 cells, or as Wadman describes them, “Lab grown human foetal cells as clean, safe, normal, non-cancerous micro-factories for making viral vaccines.” This would eventually revolutionise the study of virology and would play a significant part in billions of vaccines around the planet. We learn that the word virus derives from the Latin, meaning ‘slimy fluid’. Wadman gives us a tour and description of many viruses, from the relatively tame Rhinoviruses (responsible for the cold), to the more terrifying and lesser seen, Filoviruses, which include the Marburg and Ebola virus. Although based primarily in the US, this is a journey that takes us to the UK, Iran, Sweden, Germany, Australia and sub-Saharan Africa, showing us just how global this subject is. Wadman explores many of the viral histories, like the rubella epidemic in Australia in 1940, that would have a devastating effect on pregnant women, resulting in deafness, cataracts, microcephaly, heart defects and intellectual disability. An ophthalmologist by the name of Norman McAllister Greg, was the first person to recognise congenital rubella, but his findings were largely dismissed. It was only many years later when there were a number of serious rubella outbreaks throughout the northern hemisphere, that scientist would begin to take notice and action. Though perhaps the most chilling case, was regarding Chester Southam. He became notorious amongst medical ethicists for injecting aggressive cancer cells into healthy prisoners at the Ohio State Penitentiary. He had also injected cancer cells into dying cancer patients in the 50s. This was by no means an isolated case, there were plenty more scientists doing plenty more experiments on unsuspecting patients in many places throughout the States, right through into the 70s when the Tuskegee syphilis experiment was uncovered in rural Alabama. “Beginning in 1980, new laws and court decisions allowed biologists to make serious money on their inventions. The changes blurred the once sacred boundaries between business and biology, and by the early 1980s they were turning some biological scientists into wealthy men.” This was triggered by the Diamond v Chakrabarty case, and the Bayh-Dole Act that opened the floodgates for a new era of commercialisation and commodification. This would change the landscape permanently and basically lead to the start of the modern age of the biotechnology industry. Wadman also highlights the potential fatal consequences when long established vaccine programmes are withdrawn, citing the case of the military stopping their Adenovirus shots, which resulted in the death of two young men. She also shows how religious extremism in the States can and has been such a barrier to progress, tolerance and acceptance and how this creates so many difficulties. Unlike the accepted SV40 vaccine, Hayflick used human tissue and so was free from hidden viruses, unlike the vaccines derived from animals, such as puppy kidneys (which caused arthritis and other pains), or worse, monkey kidneys (later referred to as the ‘dirtiest organ known’ by one expert), which harboured many nasty viruses, including the ruthless Marburg virus. The relevant authorities were notoriously obdurate and refused to even consider Hayflick’s vaccine for many years, even though it was being used by millions in other countries around the world. This was a really interesting and thoroughly researched piece of medical history. It’s largely accessible, though due to the subject, it does grow a little dry in areas, but overall this shows what a phenomenal job that vaccines have done, and will continue to do. It reminds us that regardless of presumed intelligence and time spent studying, scientists are just as fallible as anyone else, they make mistakes, their companies make profit, but more importantly they make progress, and it’s us who reap the fruits of this progress. The chances are you have received at least one vaccine containing Hayflick’s WI-38 cells. This book should also give food for thought, for those still resistant to the idea of MMR vaccinations. Much of the work done in tissue culture by the biologists discussed in the book was the exact sort of work I did working in a clinical virology laboratory for ten years. Also, I had rubella (as a toddler and not prenatally - I was too young for the vaccine). So, double whammy there. Pretty fascinating stuff, and scary to think what it took to develop polio and rubella vaccines in the first place. I was much less interested in the parts involving litigation and such. I have not enjoyed a book alinvolving science as much as this one in a long time. The history of vaccine making is very interesting, and the author is able to write it like a story, while still throwing in scientific concepts for non-scientists. It was so interesting to learn how research in a lab was done without all the technological advances we have nowadays, and sad to see how clinical trials were conducted. Wadman reveals more than the reader probably wants or needs to know about how the most commonly used vaccines today (rubella, rabies, chickenpox, mumps, etc.) were developed and regulated. Though it's a slog to get through, it's fascinating - particularly so as it considers the life and work of Leonard Hayflick, who championed the use of human cells still being used today. This nonfiction account of the spectacular and life-saving advances in vaccine development over the last fifty or so years is in some ways reminiscent of The Innovators: How a Group of Hackers, Geniuses and Geeks Created the Digital Revolution by Walter Isaacson. Until you see it set out before you, it is difficult to imagine or remember how much important history has passed in this field in just the last few decades. The book begins and ends with Leonard Hayflick, a cell biologist credited with This nonfiction account of the spectacular and life-saving advances in vaccine development over the last fifty or so years is in some ways reminiscent of The Innovators: How a Group of Hackers, Geniuses and Geeks Created the Digital Revolution by Walter Isaacson. Until you see it set out before you, it is difficult to imagine or remember how much important history has passed in this field in just the last few decades. The book begins and ends with Leonard Hayflick, a cell biologist credited with, among other things, discovery of the Hayflick Limit, an amorphous number that identifies how many times cells, especially human cells, can split and thus reproduce in a laboratory culture. In effect he established that non-cancerous cells cannot live and expand in culture indefinitely, which was in direct contradiction to the established wisdom of the day. He developed a human cell culture known as WI-38 that had the remarkable quality of being able to culture or reproduce in the lab multiple times without becoming cancerous or developing other anomalies. He promoted these cells vigorously for the purpose of researching cell aging, and, perhaps more importantly, for use in producing "clean" vaccines. Hayflick was a controversial figure for several reasons. He was treated as hired help at the Wistar Institute where he worked culturing cells for the virus researchers, the supposed stars, a fact that he deeply resented. His discovery of cell death was not easily accepted by the scientific community, but more than that, it was his fateful, and questionable, decision to take the WI-38 cells he had developed with a government grant to his new position at Stanford University, and eventually to begin selling them through his own corporation. Some at the National Institutes of Health (NIH) considered him a thief while others saw him as an underappreciated scientist of outstanding ability. The book is not a biography of Hayflick, however, although he is the central figure. Other virus researchers, doctors, biologists and bureaucrats are featured at length. The process of cell culture and vaccine development is described in considerable detail in language a layman like me can understand. I was awestruck at how complex the process is. Really top-notch science is required - hands-on lab work especially - and some risky experiments and testing that raise ethical questions. Experiments of the day involved inoculating subjects with untested vaccines, including live ones that could give him the disease. Subjects were often orphans, prisoners, soldiers, babies, the mentally deficient, and others who had little or no ability to consent. Many or even most were unaware that they were even test subjects. The diseases involved included polio, rubella (German measles), rabies, and adenovirus. The WI-38 cells were derived from an aborted fetus. It is clear that the field is replete with controversial and ethically troubling issues. In 1952 the USA was struck by a polio epidemic. In this single epidemic, within a single country, 58,000 people were infected, mostly children. 3,000 died and 21,000 were left with various degrees of paralysis. In the early sixties, a rubella epidemic that swept the USA is estimated to have caused 30,000 stillbirths, and in addition, 20,000 cases of Congenital Rubella Syndrome, in which babies are born with (either singly or in any combination), blindness, deafness, heart problems, learning disabilities, or other health issues. Today the fear and suffering caused by polio and rubella are all but forgotten in the Western World, something achieved through the development of vaccines. Meredith Wadman’s book takes us through their development, the intimidating difficulties that had to be overcome, and the crucial role of human cell cultures in their production. The book focuses on the vaccines for polio and rubella, and to lesser extent those for rabies and Hepatitis A. It also focuses very much on the USA (nothing wrong with that, the author is herself American). It’s not all inspirational stuff though. These vaccines were developed using means that would be considered highly unethical today (and some people considered them so even at the time). These included injecting experimental vaccines into orphans and/or children with learning disabilities, to test their effectiveness. The title of the book refers to a vaccine “race” and indeed there was a “race” in more senses than one. Partly it was a race to prevent the terrible harm being done to children and families by polio and rubella. Partly though there was also a race between different teams of researchers, each keen to cross the line first in developing an effective vaccine. Those who developed the vaccines were dedicated people with brilliant minds, but they were also human beings with the full range of human flaws, and part of what you get from this book is that scientists can be as greedy and petty-minded as anyone else. Personally, I found the political and business aspects of the book to be the least interesting part. The scientific story was fascinating. There are things that as a young adult now, I just take for granted. The Vaccine Race by Meredith Wadman reminded me of just how different life used to be. This work is even more relevant today, as currently in Minnesota, the state is in the the midst of the largest measles outbreak in years due to the efforts of anti-vaccination advocates. I really recommend this book to understand the process of vaccine development. I came away from this novel with a new appreciation of all the work and controv There are things that as a young adult now, I just take for granted. The Vaccine Race by Meredith Wadman reminded me of just how different life used to be. This work is even more relevant today, as currently in Minnesota, the state is in the the midst of the largest measles outbreak in years due to the efforts of anti-vaccination advocates. I really recommend this book to understand the process of vaccine development. I came away from this novel with a new appreciation of all the work and controversy that has led to the medical revolutions that are vaccines. This novel traces the history of vaccines and the most influential developers of the field. Wadman even delves in to the cultural shift in the scientific community in the discussion of science and intellectual ownership versus profit. Another area that is examined is the development of research ethics. There has been a change in the last century concerning the rights of research participants. The route to effective vaccines has not always been conducted in a way that is consistent with our current standards of research. The young and poor were taken advantage of in the quest for vaccines, and Wadman does not gloss over this topic. Overall, Wadman is successful of marrying the scientific aspects of this novel with the human aspect of vaccine development. It's a great example of non-fiction that I think is accessible to every day readers. I encourage everyone to pick up a copy and read about the development of the vaccines that save millions of lives around the globe. This is a difficult book to describe in some ways, as it lumps together a few different stories that are related but sometimes only tangentially: it discusses the various competing vaccines for (especially) rubella, the development and ownership of human cell lines that could be used for vaccine-making, and the various political battles in the field of vaccine research. It's an interesting set of subjects, but the writing here is plodding. Wadman will never miss an opportunity to mention when an This is a difficult book to describe in some ways, as it lumps together a few different stories that are related but sometimes only tangentially: it discusses the various competing vaccines for (especially) rubella, the development and ownership of human cell lines that could be used for vaccine-making, and the various political battles in the field of vaccine research. It's an interesting set of subjects, but the writing here is plodding. Wadman will never miss an opportunity to mention when an interview happened (even when it doesn't much matter) or to repeat extraneous descriptive information about something every time it comes up. That repetition at times seems entirely self-undermining: e.g., if you didn't learn the first time that a vaccine got its name from the boy from whose throat the original culture was swabbed, or that another one was derived from viruses in the urine of an eleven-year-old girl, it presumably will not cue your memory to have those facts repeated. But if you did learn it the first time, then the repetition is just pointless. An interesting non-fiction book tracing the development of several vaccines (mainly rabies, polio, and rubella) in the 60s through the 80s. One main focus of this book is the development of the WI-38 cells by Leonard Haflick - the first non-cancerous, self-replicating, line of clean human cells that allowed vaccines to be developed using human cells instead of potentially disease ridden monkey cells. The discussion on this line of cells actually branches off into non-vaccine related science, par An interesting non-fiction book tracing the development of several vaccines (mainly rabies, polio, and rubella) in the 60s through the 80s. One main focus of this book is the development of the WI-38 cells by Leonard Haflick - the first non-cancerous, self-replicating, line of clean human cells that allowed vaccines to be developed using human cells instead of potentially disease ridden monkey cells. The discussion on this line of cells actually branches off into non-vaccine related science, particularly into the topics of aging and cancer. The book also verges off to discuss the politics of science at the time, people affected by rubella or polio, and questionable ethical practices at the time - mainly testing vaccines on orphans, disabled, or prison populations who didn't really give consent to become medical experiments. This book is quite engaging. It explains the science in an easy-to-understand manner and ended with me wishing that the story continued. One warning - this does include details (although not very descriptive) of the morally and scientifically dubious practices' of running medical experiments on animals. A truly well done telling of a somewhat disturbing story. One should bear carefully in mind that Mrs. "X," the mother of the aborted child that led to all this 'progress' was never informed that the remains of her offspring were used this way. And as we listened (we were traveling together so got to share the experience) we kept coming around to how similar the practices of our medical researchers paralleled in so many respects those of the Third Reich, without the swastikas, of course. Still, an A truly well done telling of a somewhat disturbing story. One should bear carefully in mind that Mrs. "X," the mother of the aborted child that led to all this 'progress' was never informed that the remains of her offspring were used this way. And as we listened (we were traveling together so got to share the experience) we kept coming around to how similar the practices of our medical researchers paralleled in so many respects those of the Third Reich, without the swastikas, of course. A great read for science buffs interested in the history of vaccines, but can be a bit of a slow read. While the content was great and some of the stories interesting, I couldn't bear to give it any higher of a rating because of just how dense the writing was. The beginning lures you in, and you think this will be a historical book that will keep you tethered with its prose. Instead, it's more a textbook with details on the history of vaccines, their uses, and the ongoing controversy surrounding A great read for science buffs interested in the history of vaccines, but can be a bit of a slow read. While the content was great and some of the stories interesting, I couldn't bear to give it any higher of a rating because of just how dense the writing was. The beginning lures you in, and you think this will be a historical book that will keep you tethered with its prose. Instead, it's more a textbook with details on the history of vaccines, their uses, and the ongoing controversy surrounding them. This is a very thorough, well-researched, and intriguing overview of the scientific discoveries that led to the development of safe and effective vaccines against rubella, measles, mumps, chicken pox, rabies and various other illnesses beginning in the 1950s in the United States. It also delves into issues like bioethics when it comes to setting up experimental vaccine trials, and the shift toward profit-driven research that occurred in many universities in the 1970s and 80s. What this book does This is a very thorough, well-researched, and intriguing overview of the scientific discoveries that led to the development of safe and effective vaccines against rubella, measles, mumps, chicken pox, rabies and various other illnesses beginning in the 1950s in the United States. It also delves into issues like bioethics when it comes to setting up experimental vaccine trials, and the shift toward profit-driven research that occurred in many universities in the 1970s and 80s. What this book does not cover is the more recent attacks by anti-vaccination advocates who claim (falsely) that vaccines cause autism as well as various other maladies. The bulk of the book focuses on the work done at the Wistar Institute in Philadelphia, Pennsylvania by Leonard Hayflick, who discovered that non-cancerous human cells will not divide indefinitely, and his work in creating WI-38, a cell line derived from an aborted fetus that proved crucial in the development of numerous types of vaccinations. Later on, the book covers the bitter legal feud that developed between Hayflick, the Wistar Institute, and the US government over who owned the cells. This serves as a jumping off point for the discussion of the ability of research institutions to patent and monetize their innovations, and the impact, both good and bad, that this had had over the science world. Aside from the amazing scientific achievements made in this time period, Wadman also shines a critical light on the numerous ethically questionable experiments undertaken by numerous scientists and institutions in their search for the most effective vaccines. Vaccines were tested on soldiers, prisoners, developmentally disabled persons, and children who resided in the care of church-run hospitals and orphanages. While not on par with the horrifying Tuskegee syphillis experiment, or the intentional infection of healthy prisoners with hepatitis, the lack of full disclosure and the neglect of obtaining informed consent from the subjects is extremely worrying. What's even more scary is how nearly universally accepted these practices were. It wasn't until the mid-1960s that these practices started to attract real scrutiny within the scientific community. The revelation of the Tuskegee experiment in 1972 caused a similar furor to erupt within the general public. In a nutshell: something even a scientist can read and enjoy while learning new things! Meredith Wadman's book explains in depth how the vaccine making industry evolved in the 60 and 70s, without shying away from uncomfortable topics such as: human trials conducted on people unable to give informed consent; the ugly side of scientific rivalry; major FDA fails to protect the American consumers all because of a ridiculous dose of ego. So while the characters of her book are not heroes, the importan In a nutshell: something even a scientist can read and enjoy while learning new things! Meredith Wadman's book explains in depth how the vaccine making industry evolved in the 60 and 70s, without shying away from uncomfortable topics such as: human trials conducted on people unable to give informed consent; the ugly side of scientific rivalry; major FDA fails to protect the American consumers all because of a ridiculous dose of ego. So while the characters of her book are not heroes, the importance of their work is crystal clear. My biggest praise goes to the methodical explanation of why the development of fetal cell lines was so valuable for the production of safe and efficient vaccines. Dr. Wadman takes her time in explaining why the old cells used for vaccine making were a health hazard. At the same time, she doesn't glorify any of the characters involved. I did however get lost a lot in her timeline, as she constantly jumps back and forth in between and even in the same chapter. Unlike many scientific history books I've read recently, this one takes a more subtle approach in portraying its characters. Wadman's opinions about the events and people does surface, but her writing gives the reader enough room to form their own opinion. Probably the part that hit closest to home were the chapters describing the NIH's investigation into the selling of WI38 cells by Leonard Hayflick. As a scientist I have already had to bite down the frustration of dealing with bureaucratic strong-heads who sadly, want to do good, but lack the knowledge. Accounting and scientific method don't always work well together. But what should have worked together were the people involved. This lack of communication due to ego and stubbornness is unapologetically described in the book, and should be a cautionary tale for people working in the health industry. Let us learn from the mistakes of the past, and champion safety without creating unnecessary hurdles.